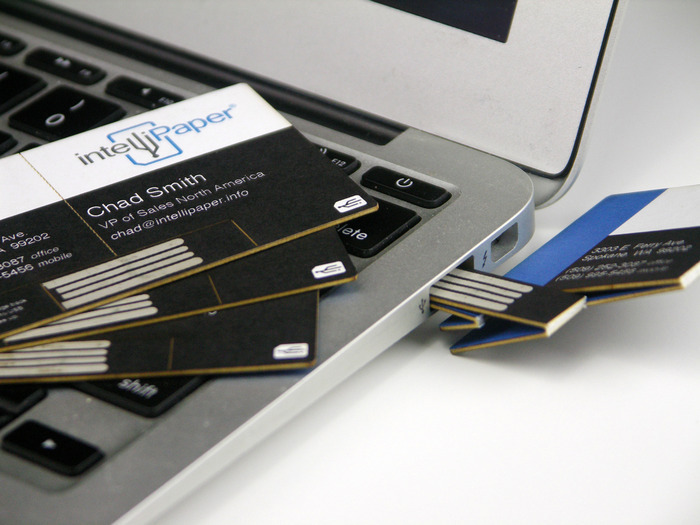 Ask Hackaday: Can Paper USB Business Cards Exist? a system for turning regular paper into a USB drive. As you can guess this piqued our interest, as all paper based technologies we had seen until now mostly consisted of either printed PCBs or paper batteries. ‘Printing a USB drive on regular paper’ (as the video says) would therefore involve printing functional USB and NFC controllers. Imagine giving your business card with pictures, videos, presentations, and websites for the recipient to interact with! paragraph that the project description contains. This leads us to one key question we have: what kind of USB drive can make a given user visit a particular website, given that he may have Linux, Windows, Mac or any other OS? They all have similar USB enumeration processes and different key strokes to launch a browser… our wild guess is that it may be detected as storage with a single html file in it. Unfortunately for us the USB detection process is not included in the video. Our final question: Is it possible to embed both USB and NFC controllers in a thin piece of paper without worrying about broken ICs (see picture above)? NFC enabled passports have obviously been around for a long time but we couldn’t find the same for USB drives. Possible or not, we would definitely love having one in our hands! Edit: One of our kind readers pointed out that this campaign actually is a re-launch of a failed indiegogo one which provides more details about the technology and confirms our assumptions. When your name is Simon and you want to build your own circuit board business card, it makes perfect sense to incorporate a game of Simon Says, and that’s exactly what [Simon] did with his Business Card. You may see a resemblance to the Engineer’s Emergency Business Card; that’s because [Simon] took inspiration from that card to build his own. The game of Simon Says is played via 4 low-profile pushbuttons and 4 0805 LEDs. The microcontroller of choice to run the game is an ATtiny45 set up to work with the Arduino IDE. But with only 5 pins available for I/O, [Simon] had to give up 4 pins to the LEDs and configure the remaining pin as an analog input. The buttons are tied into a voltage divider that feeds the analog input, so depending which button is pressed, a different voltage is read in, thus a value from 0 to 1023 determines which button was pressed. One of the great things about this write-up is that it goes through the process of etching PCBs at home using the toner-transfer method. We’re not sure how many home-etched business cards he’s willing to pass out, but surely whoever does get the card, will never forget his name. While most microcontroller powered business cards opt for something small and cheap, [Brian] is going in an entirely different direction. His business card features an ARM processor, some Flash storage, a USB connection, and enough peripherals to do some really cool stuff. This is the second iteration of [Brian]’s business card. We saw the first version, but this new version makes up for a few mistakes in the previous version. The biggest improvement is the replacement of the Molex USB plug with bare traces on the board. [Brian] couldn’t find a board house that could fab a board with the proper thickness for a USB plug, but a few strips of masking tape did enough to beef up the thickness and make his plug nice and snug. Also, the earlier version had a few pins sticking out of the board for programming purposes. This wasn’t an idea solution for a business card where it would be carried around in a pocket, so these pins were replaced with a connectorless programming adapter. Just a few exposed pads gives [Brian] all the programming abilities of the last version, without all those prickly pins to catch on clothing. With his new business card, [Brian] has an excellent display of his engineering prowess and a very cool toy; he has a project that will turn this card into a keyboard emulator, randomly activating the Caps Lock button for a few seconds every few minutes. A great prank, and a great board to give to future employers. [Jay Kickliter] sent in his latest electronic business card. This time, his goal was to make it much cheaper so he could actually afford to give it away. He did pretty well considering the two week timeline he mentions. This card is using an MSP430 with the capsense library to light up some LEDs any time the card is handled. While he states that it is much cheaper than his last, it is still around $8 a card, so he won’t be tossing these into everyone’s hands. He does point out though that it is always helpful to have hardware to show off at a hardware interview, and an electronic business card does that job very well. As usual, you can read more details and download the files at his blog. [Limpkin] decided to give the whole embedded business card thing a try. Here is his finished project, a low-profile mass storage business card that doesn’t cost an arm and a leg. Sure, the $6 price tag could score him a hundred paper cards, but those don’t light up like this one does! The main components on the card include an AVR microcontroller, a flash memory chip, and an ESD protection chip. The latter is to make sure a static shock on the USB connector doesn’t zap the MCU. Speaking of, he went with an AT90USB162 which runs from an external 8 Mhz oscillator. Sure, it’s not the fastest thing out there, but since there’s only 16 Mb of flash on this card we don’t think you’ll notice any data transfer delay. The processor is running the LUFA stack and has two flavors of firmware. One that enumerates as an HID keyboard to automatically use keyboard shortcuts to launch a browser and load up his website. The other implements a mass storage device. If you don’t like the electronic route, you could always go with some laser cut metal. We’ve heard that [Kevin Mitnick’s] business card has snap-out lock picking tools kind of like these.